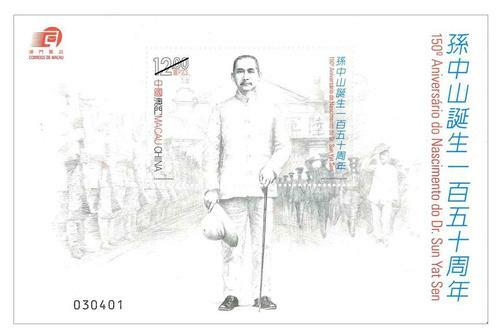 Stamp Issue "The 150th Anniversary of the Birth of Dr. Sun Yat Sen"
Sun Yat Sen was the great pioneer and revolutionist of democratic revolution in modern China; he was born on 12th November 1866 in Cuiheng Village, in Xiangshan County (now Zhongshan City), Guangdong Province. 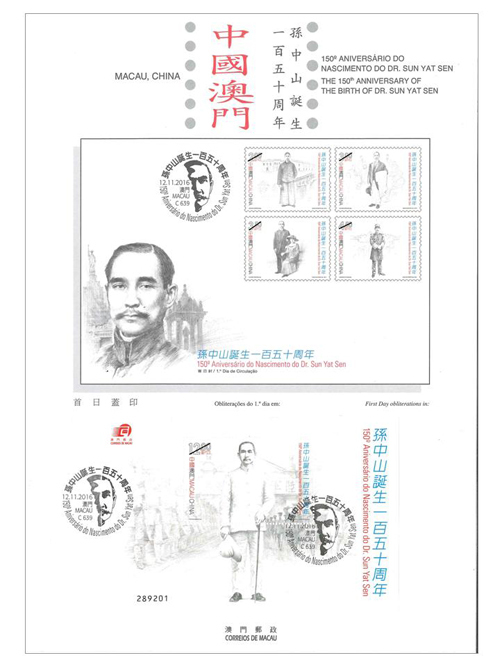 It happened to be the 150th Anniversary of the Birth of Dr. Sun Yat Sen this year, Macao Post, China Post and Hongkong Post are jointly issue this stamp theme on 12th November, 2016, in order to commemorate this day of great historic significance. 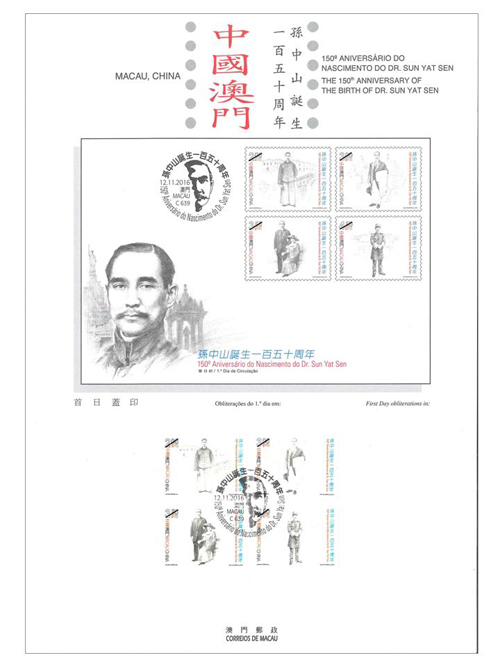 This is the ninth joint issue of the three postal administrations. 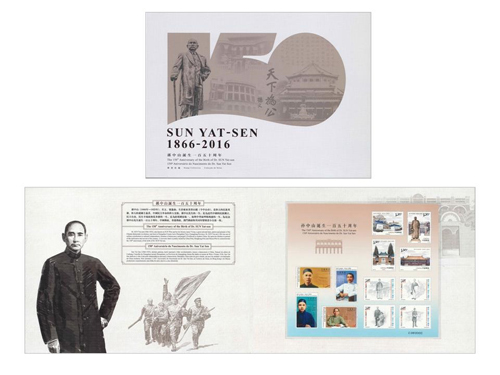 This issue includes a set of four stamps and one souvenir sheet, the five important nodes of Dr. Sun Yat Sen’s life are depicted by sketches. 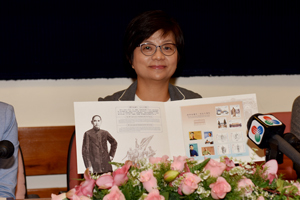 After summarizing, refining and sublimating, the history is condensed in an instance, which vividly displays the historical scenarios when this great person was carrying out his medical practice at Kiang Wu Hospital in Macao, establishing the “Clinic of Sun Yat Sen” at No.14 Senado Square (the current site of Macao Post) in order to help the public, convening the Highest Cadres Meeting of Tongmenghui in Shanghai, being together with his wife Soong Chingling when he was organizing revolutionary activities in Tokyo, assuming the post of Generalissimo of Military Government in Guangzhou, and officiating the opening ceremony at the Huangpu Military Academy in Guangzhou. 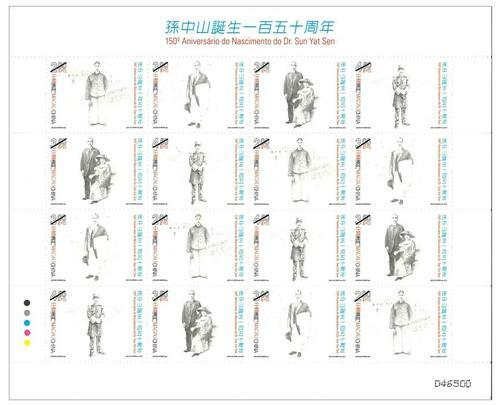 Among the total printing quantity of stamps, 733,500 sets of stamps are integrated into souvenir sheets jointly issued by China Post, Hongkong Post and Macao Post, which have been transformed as presentation pack. Among the total printing quantity of 733,500 packs, the total of 100,000 packs to be sold in Macao are numbered with the code “C” representing Macao, this pack is priced at 50.00 patacas each. 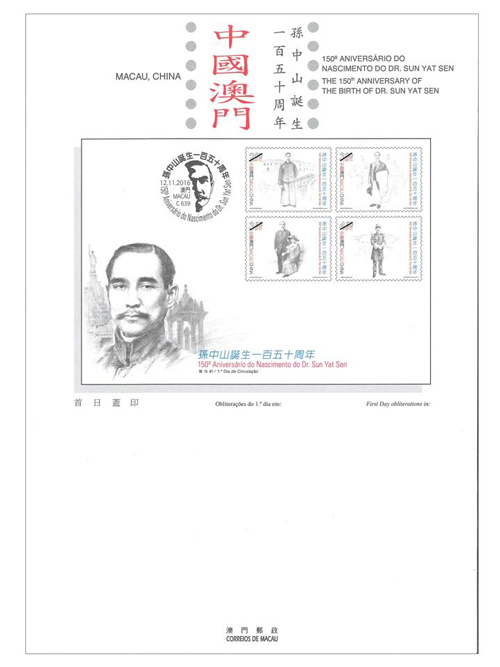 The stamp designer of this issue is Mr. Lio Man Cheong, and the text of the information brochure is written by Mr. Lei Kun Teng. This is the thirteenth theme in 2016. 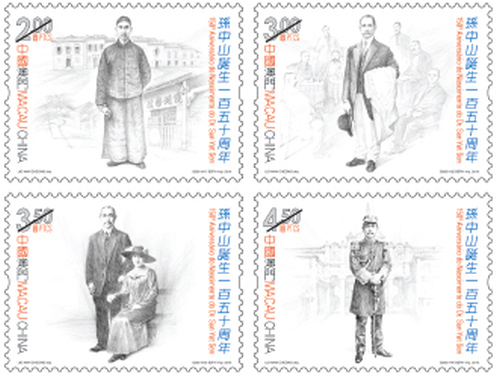 The previous issued stamps are “Lunar Year of the Monkey” on 22/01/2016, the label stamp “Lunar Year of the Monkey” on 22/02/2016, “Scenery of the Imperial Palace in Beijing” on 01/03/2016, “325th Anniversary of the Establishment of the Public Security Police Force” on 14/03/2016, “Chinese Classical Poetry – Ballad of Mulan” on 08/04/2016, “Macao Seen by Chan Chi Vai” on 28/04/2016, “Museums and their Collections V – Maritime Museum” on 18/05/2016, “FIVB Volleyball World Grand PrixTM – Macao 2016” on 17/06/2016, “Mountains and Rivers of the Motherland – Yangtze River” on 11/07/2016, “Games 2016” on 29/07/2016, “Paintings of Macao’s Famous Artists” on 25/08/2016, “120th Anniversary of the Birth of General Ye Ting” on 10/09/2016, and “Chinese Landscape Painting” on 09/10/2016. 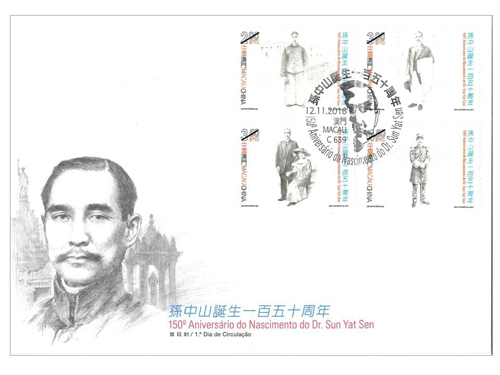 Technical Data of Stamp "150th ANNIVERSARY OF THE BIRTH OFDR. 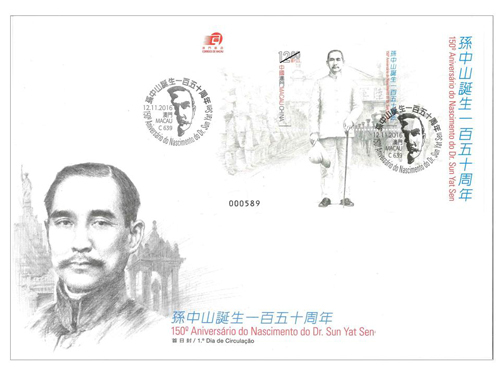 SUN YAT SEN"